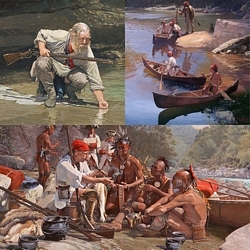 This early frontier scene of a tranquil wilderness waterway reflects an eastern woodland Indian’s suspicion of any unannounced presence to his domain. A group of unknowns has silently glided into view from an adjoining stream. Although they may be brothers, they could also be hostile to his clan. Cautious observation is prudent. He does not know the design of their canoe nor their dress. Are they ally or foe? He remains secluded, suspicious and out-numbered. The five and later six nations of the Iroquois controlled much of what is today western New York and Pennsylvania. Those who used or traversed these areas only did so with a clear understanding that they needed permission.